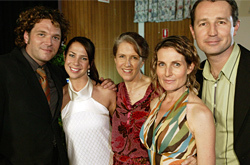 As Australia says goodbye to Sally Fletcher, the return of original characters Pippa, Floss, Carly and Steven, as well as Tom's heavenly appearance a few weeks ago, have celebrated the 20 year history of both Sally and the show. Whilst Alex Papps was unfortunately not available to return as Frank Morgan to add to the lineup, many people may be also wondering what happened to the other member of the original Fletcher family - Lynn Davenport. Almost twenty years ago a 14/15-year old Helena Bozich was heralded up to Home and Away's production offices and told that she was no longer required on the show. She was too old for Sally's storylines and too young for the storylines featuring the elder teenagers and so after just 120 episodes, Lynn left the Fletcher house. She returned to live with her biological family and apart from a one episode cameo a few weeks later after Chris Fletcher was born, was never seen again. In 2000, Pippa mentioned that she hadn't kept contact with Lynn, adding that whilst that was sad, it must have meant that her reunion with her family had went well. Realising acting wouldn't provide her with a stable employment, Helena has not had any credited roles since, presumably turning her attentions to her studies. 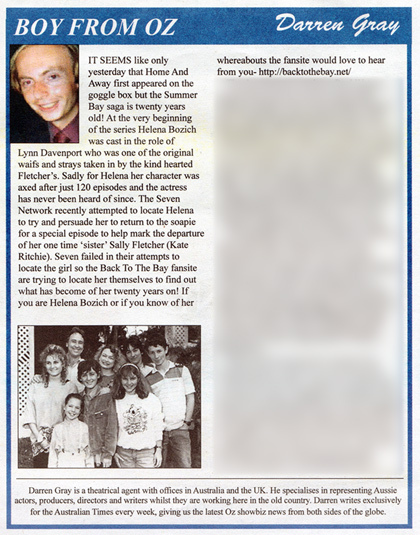 Now 20 years on, the Production Office decided to track Helena down, in the hope that she may return for the departure of Sally Fletcher. Did Helena turn them down, unwilling to return the show that had thwarted her dreams two decades ago? Maybe that would have been the reply, but unfortunately they never got that far. "We actually couldn't track Helena down to even ask her, which is why she doesn't appear. She has disappeared in to the big wide world and who knows what has become of her." Unfortunately, being female, she may no longer be a Bozich and might have something a lot more common, like Smith. Has she moved to your town? Has she moved abroad? Is she even still alive? I have just come back from a trip to New Zealand. I was in a shopping Centre in Tauranga and I recognised this woman, I couldnt place from where. It then dawned on me where she was from -"Home and Away". So I took the chance and went over and asked her, did she play Lynn on the show? She replied "Yes I did, a long time ago. I haven't thought about it in a long time" So we just got to talking generally about things - she moved to New Zealand 15 years ago, she is now married and has a child. Because I am not an avid fan I asked what her name was, she said "Helena Williams". I then asked her if she watches the show anymore, she replied "from time to time, I watched Kate's last episode, but since that, not much". So that was that, I decided to Google 'Lynn from Home and Away' and I found the"Where is Helena Bozich?" page. I couldnt believe there was a search for her. If I knew I would've taken a photo or told her that "Home and Away" was looking for her. Anyway I just thought I would let you know.